The race to be the first to fly was an amazing race… a race like no other. It spanned decades, circled the globe, and took many lives. The aeronautical pioneers made up the rules as they went along. There was an explosion of information. One hundred years ago aeronautical aviation was a new exciting field with groundbreaking discoveries and inventions occurring on an almost daily basis. Many people contributed individual aspects to the success of manned flight, each adding their own exquisite morsel. Early aeronaut Captain Louis Ferber (1862~1913) declared that the kite was only an anchored aeroplane, or the aeroplane an unanchored kite. He stated that the forces that operate in flying a kite are the same forces that operate in the flight of an aeroplane. There are certain connections and characteristics between the kite and the aeroplane that are inexorable. In flight both are subject to the influence of resistance, propulsion, lift and weight. In 1805, Sir George Caeley (1771~1857) realized the laterally stabilizing effect of the dihedral angle in airplane design. Caeley was the first to see that a cambered aerofoil provides more lift then a flat one. He was the first to equate the aerodynamic significance of the kite. It was Caeley who laid down the principles of heavier-than-air flight. From that point on, the interest in manned flight became an international obsession that grew by leaps and bounds over the next century. By the time the Wright Brothers joined the race there was a multitude of information available to them. The Wright’s corresponded with Chanute and the Smithsonian Institution and began to devour every bit of material they could locate on the principles of flight. Very few other inventions, at any other time in history, simultaneously engulfed so many visionaries. It captured the passion of many, and turned into an obsession for many more. Long before the Wright Brothers began working on manned flight in Dayton and Kitty Hawk, the world was abuzz with experimentation, design and invention. The aeronautical society of Great Britain was founded in 1866. Manned powered flight was coming and there was no stopping it. In Germany, Lilienthal’s significant contributions and dedication were widely known and legendary to flight enthusiasts of the time. Lilienthal’s death in 1896 was reported to have motivated the Wright Brothers towards their historic path. Australia’s Lawrence Hargrave had been working diligently on flying machines and presenting papers on the subject since 1885. 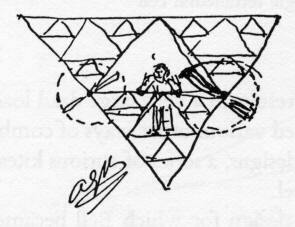 His invention of the box kite in 1893 influenced early aeroplane design significantly. He was instrumental with his work on motors and his continued work on curved wings. 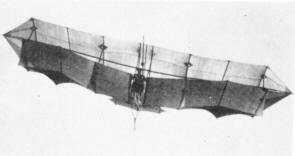 Samuel F. Cody initially used trains of kites to man-lift (patented in 1901), but eventually fit an engine to a modified kite and made the first powered flight in England. In 1895, Alexander Graham Bell began his experiments with flight; rotors, wing, gliders, and kites, and made his team the first to fly in Canada. By all accounts, during the late 1800’s and early 1900’s you couldn’t throw a stone without hitting someone trying to fly. The new aeronaut came in all shapes, sizes, and nationalities; Frost of Wales, Pilcher from Scotland, Langley & Avery of the US, Maxim & Baden-Powell of England, Schwartz; a Hungarian, Pearse in New Zealand, Brazilian Santos-Dumont, Voison in France and Ellehammer from Denmark. Even Thomas Alva Edison, speculating on his notes of 1897, proposed a helicopter comprised of two kites attached by a pair of fifty-foot strands of piano wire spinning about a vertical axle at 20,000 feet per minute. Watch your head! The contribution to the success of manned flight by American Octave Chanute (1832 ~1910) cannot possibly be overstated. It is his careful cataloging and disseminating of accurate factual information of the day, as aviation historian, that he is best known. Chanute initially authored and presented papers on the progress of aeronautical experiments beginning in 1889 entitled Aerial Navigation. He did a series of magazine articles called Progress in Flying Machines. According to the American Heritage History of Flight, Chanute’s Progress in Flying Machines, published in 1894 in book form, was the first factual and trustworthy history of man’s attempt to fly and one of the great classics of aviation. These inventors of the day, pioneer pilots, conducted many dangerous experiments in their quest for flight. They were persistent, courageous, and perhaps just a little crazy in their attempts to conquer the air. They all proceeded, and varied in their quest for information during the course of conducting experiments. There were some very hard feelings towards the Wright Brothers in both in the US and abroad. Many felt that since the Wrights benefited from others work; they should share their work as well. The Wrights were not quick to give credit to those who preceded them. The brothers were so secretive about their work that most people did not even know they had flown until 1904 or 05. Communication was much different back then. Some say it was the complete apathy from the public and government that surrounded the Wright’s remarkable accomplishments that soured them. In October 1907, Alexander Graham Bell, Curtiss, Selfridge, McCurdy and Baldwin formed the Aerial Experiment Association in Hammondsport, New York, and began to build aeroplanes of each members’ design, sharing features borrowed from both Voison and the Wright’s designs. Their third plane, the June Bug, attracted far more attention and acclaim then the Wright Brothers had ever received, especially with Alexander Graham Bell’s notoriety and influence. The June Bug was flown by Glenn Curtiss; a lean, adventurous man, obsessed with engines and speed. He was the archetypical emergent aviator, determined to conquer the skies. 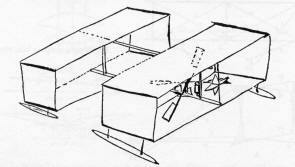 The June Bug was fitted with wing tip ailerons. This created a historic conflict with the Wrights. The Wright Brothers considered any type of moveable wing section to be an extension of their wing-warping idea. They sued Curtiss for infringing on their patent. The issue was bitterly fought in the courts and eventually settled in favor of the Wrights. The year 1908 saw the Wrights vindicated both here and abroad. The United States government issued the Wright’s a contract to buy military planes and a French company bought one of their designs for production. Eventually, Curtiss and the Wright Brothers put their disagreements aside and did work together on projects. Some people like Hargrave felt that patents were nothing more then a license to steal. Others like Cody were very quick to secure patents on designs. 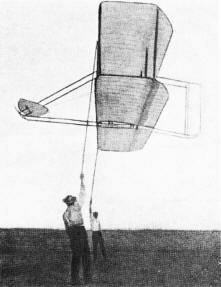 Hargrave’s box kite was illustrated in Mean’s Aeronautical Annual and, because of that, played a vital role in the development of the European aeroplane. It’s hard to imagine the wildness of that time. In order to get a patent all one had to do was walk into a patent office and describe in very general terms what the idea for the product was and a patent would be issued. You did not have to be the inventor of the product, nor did you have to have any type of blue prints. A person could spend years of their life and all their savings on a prototype only to have the idea stolen out from under them simply because they were not first to the patent office. The theft of intellectual property and spying was rampant. Intellectual paranoia ruled the day. None of this is to say that the Wright’s did not achieve great things and make a huge significant contribution, but only that heavier-than-air, controllable, manned flight, was a collaborative effort between many people over many years. However, the Wright Brothers were indeed the first. There are a lot of people who want to dispute that, then and now. But none have ever provided any concrete evidence to back it up. Even though Chanute’s Progress in Flying certainly had an impact on the Wright Brothers, there were major differences between the Wright’s version of an airplane and others of that era. It was stable, safe wing that Hargrave and others attained to. Orville and Wilbur Wright, though, thought that an unstable aircraft that was controllable through steering was the answer. It has often been debated how the Wrights, two bicycle mechanics from Dayton, Ohio, with no college education, succeeded where so many before them had failed. The journey to the first successful airplane was engineered and developed step by step. The brothers first started with an interest in things that flew, particularly kites and flying toy bird powered by rubber bands. They read about Lilienthal’s research and death and concluded that controlling the flying aircraft was the biggest obstacle. They set about learning everything they could about aeronautical knowledge of the day and began correspondence with Octave Chanute, eventually nurturing a warm friendship. Throughout their trial and error years, Chanute’s friendship and encouragement meant much to the lonely experimenters at Kitty Hawk. The Wright Brothers pioneered many of the research methods still used in the aviation industry today. They built scale models, as well as full size gliders, testing them and improving them. The brothers from Dayton built a kite in 1899 that could be maneuvered by pulling on the two control lines. They obtained roll control by warping, or changing the shape of a part of the wing. During the years between 1900 and 1902, the Wrights built several large un-powered aircraft to design and develop and fine-tune their ideas on flight. These craft were often flown as either piloted gliders or as un-piloted kites. These aircraft were designed and built in Dayton but flown in Kitty Hawk due to the more consistent winds in North Carolina. Questions about the aerodynamic data that the Wright Brothers were basing their designs began to arise. They built their own wind tunnel to test their models. They devised a particularly clever balance system to compare the performance of various models. Testing hundreds of different wings and airfoil sections in different combinations improved their glider performance. They returned to Kitty Hawk in 1902 with a new aircraft whose design was based on the new wind tunnel data. This machine was the first aircraft in the world that had active controls for all three axes: pitch, yaw, and roll. All that remained at the end of 1902 for the first successful airplane was the development of the appropriate engine. It is widely believed that the lack of a lightweight engine was the factor that hampered the likes of Lilienthal’s and Caeley’s progress towards powered flight. Orville and Wilbur also could not locate an engine manufacturer that could meet their needs. They required their engines to have both high horsepower as well as be lightweight. The Wright Brothers answer to this dilemma was to build an engine. In a span of six weeks they built their own 12 horsepower engine. They also built very efficient propellers for the aircraft. Their wind tunnel results helped them to realize that they must be shaped as a rotating airfoil. In September of 1903 Orville who was 32, and Wilbur Wright who was 36, returned to Kitty Hawk with their new aircraft. After several frustrating difficulties with the propeller shafts and transmission sprockets…they finally made four successful flights on December 17, 1903, the first at 10:35 am, and became the first aircraft to take off under its own power. The Wright Brothers had won the race. And the rest, as they say … is history. Getting an accurate appraisal of the Wright Brothers is extremely difficult. There is an incredible amount of conflicting information written about them. One book said they were generous with their information and time with anybody who asked them about their flying experiments. Another called them good natured and funny, while another was not nearly so kind in their descriptions of the brothers. The original Wright Flyer was in the museum of London because the Smithsonian Institution repeatedly refused to recognize it as the first aircraft capable of sustained free flight with a man aboard, giving this honor instead to Langley (Secretary of the Smithsonian). After Orville Wright’s death in January 1948, and after the Smithsonian reversed it’s controversial opinion, the Wright Flyer was returned to the United States and put on display on December 17, 1948 at the Smithsonian Institution…forty-five years after it’s first flight. The greatest achievement of all time may have been met with appalling indifference when it first occurred. But things will be very different for the centennial. There is a considerable amount of hoopla surrounding the centennial of flight. At least four teams of craftsman and scientists across the United States are building replicas of the first wood-and-fabric airplanes. The replicas are to be flown on or before December 17, 2003 the 100th anniversary of the Wright’s first flight. The World Kite Museum and Hall of Fame in Long Beach, Washington is mounting several traveling exhibits to commemorate ‘the roles of kites in the history of aviation’. For schedule availability email info@worldkitemuseum.com. The Drachen Foundation also has great material available. John Harris’ Kitty Hawk Kites is planning their Wright Kite Festival: An Official Centennial of Flight Event on June 13, 14 & 15, 2003 at the Wright Brothers National Memorial in North Carolina. This has quickly developed into a major festival, with many exhibits, competitions, challenges, workshops… something for everyone! Exclusive special permission has been obtained to allow kite flying at the Wright Brothers Memorial for this event. See you there.